An Evening with C.S. Lewis – the year is 1963 and C.S. Lewis, the famous British author, is hosting a group of American writers at his home near Oxford. They are about to experience a captivating evening with a man whose engaging conversation and spontaneous humor made him one of the great raconteurs of his day. Getting to know someone in an hour-and-a-half sounds optimistic. Yet in An Evening with C.S. Lewis, the famous literary figure is presented as if you already know him. The set, primarily the armchair where he sits drinking tea amongst books and globes and clocks, makes you feel like you’re at your grandparents’ house, listening to your grandfather’s stories. And the brilliant portrayal of Lewis comes from a man who doesn’t seem far off from the real thing. 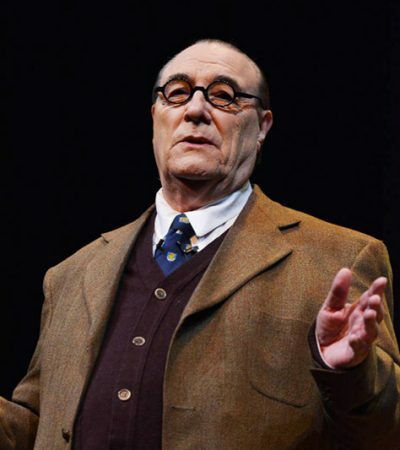 For David Payne, it was a complete mastery of his theatrical gifts, but for us there was no acting. We only saw the genuine representation of CS Lewis or as friends called him; Jack. Payne’s delivery, subtle movements, expressions and his uncanny ability to speak directly to you and stir you up in your seat kept you riveted and vastly entertained.